Anything a black liner can do, a colorful liner can do better. Although bright eyeliner might seem like unknown territory, technicolor lines are easy to pull off—it’s all in how you draw the line and your attitude. To decide on a shade, Barose recommends following your instinct and going with a liner that you’re drawn to rather than following the color-wheel theory of picking a shade opposite of your eye color or look to your outfit for inspiration. “I usually pull color from the outfit and pick shades that are either similar (but not exact so it’s not matchy-matchy) or pick a total opposite color for contrast,” he tells us. The product you use should depend on the type of line you want to draw on. 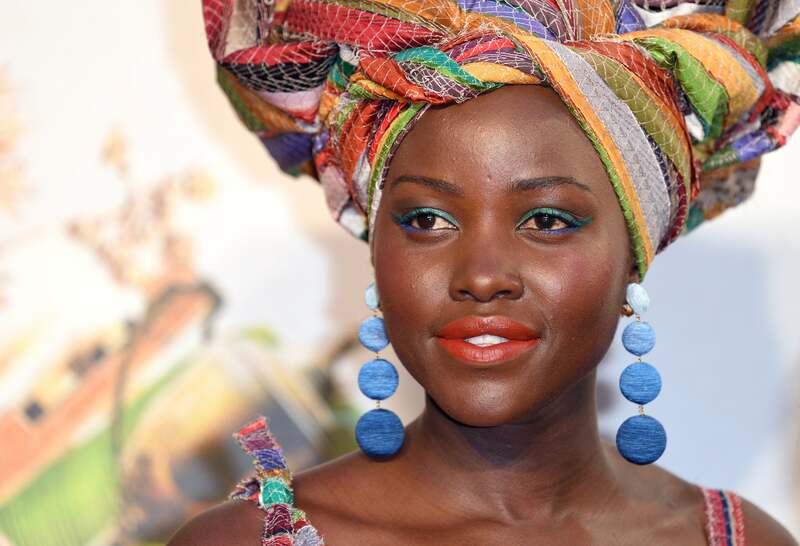 The pro, who created Lupita Nyong’o’s emerald green and cobalt liner look for theQueen of Katwe London Film Festival premiere (above), suggests working with a pencil like the Lancôme Drama Liqui-Pencil Longwear Eyeliner ($23; sephora.com) duo he used on Nyong’o and sharpening it for a precise, thin line. If you’re after a softer, smudgy look, opt for a jumbo shadow pencil such as Nars Soft Touch Shadow Pencil ($25; narscosmetics.com), and on the other end of the spectrum, use a gel formula like MAC Fluidline ($17; nordstrom.com), which can easily be manipulated for a strong, graphic cat eye. When you’re drawing the actual lines, Barose suggests starting with the tails by determining how exaggerated you want them, along with the angle. “This makes it look symmetrical and is easier to do than making one continuous line from the inner corners that wings out,” the pro explains. Once you have the tails down, connect them by lining the rest of the eyelid, with the line getting thinner towards the inner corners. As for the rest of your eye makeup, keep your brows clean, lids eyeshadow-free, and lashes natural. “Too dramatic lashes with bold liner will end up overdone and take away the cool factor of the simplicity of the bold, clean lines,” the pro says. When picking a lip color, a soft shade will keep the look modern, but a contrasting shade like Nyong’o’s burnt orange can make a major statement.